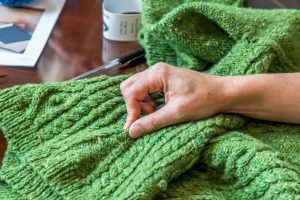 Knitting has always been an integral part of Aran Island life throughout the ages. The people in my home of Inisheer, were and still are, a very proud and artistic race of people. Early visitors to the islands commented on the island dress as unlike anything they had seen anywhere else. Their sense of colour and design can easily be seen in their hand knit sweaters and shawls and especially the brightly coloured ‘Crios’ a woven multi-coloured belt worn by the men to hold up their trousers. These brightly coloured yarns were home spun and dyed using local plants and lichens. The islanders were very particular about their craftwork and each family passed on their skills to the next generation; be that fishing skills, farming methods, currach building (a traditional island boat), stonework, weaving, needlework or knitting etc. Young boys got their first Aran Sweater for their first Holy Communion and wore it proudly on their big day. Some of those sweaters were more ornate than others depending on how good a knitting family the boy came from. Some had an elaborate display of Aran designs all over whereas others were quite plain and some had design on the upper body or yolk only, however all were of pure white soft wool and made with love to the best of the Knitter’s ability. Knitting was no easy task and like all crafts some liked it more than others. The patterns were very intricate and weighed down on the arms as the garment grew in size but nevertheless the best knitters turned out one a week. There was great competition among some knitters and they would never present a less than perfect piece for sale. If they discovered a simple mistake of any nature way down the work they would not hesitate to rip it out immediately and fix the mistake and start again. Young ladies who were good knitters were seen as a good catch for a young Island man as it was believed that they would also be good homemakers. I don’t know how true that was however when put into practice! Young men would visit particular houses in each village to play cards to pass a winters evening and the young girls would also visit and bring their knitting to chat and visit tell stories and sometimes sing. Knitting was always central to island women’s’ lives. Dare a woman be seen with idle hands! My grandparents Martin and Kate Sharry lived out their lives on Inis Oirr fishing, farming, and catering for visiting Tourists both in their tea house and providing accommodation and rearing their four children, their eldest being Mary, my mother. Granny loved to knit, crochet and lace make and we are very fortunate to have some of her special creations. One of her special stitches is the Sharry Chain Link cable that is taught by me on several of KnittingTours.com’s knitting tours.